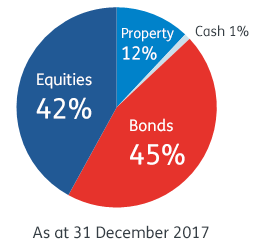 A With-Profit Bond is a safe, secure way to invest a large lump sum such as a police pension lump sum or an inheritance. Your money is invested in Metfriendly’s With-Profits Fund which holds bonds, shares, property and cash. A With-Profit Bond is normally the next place to consider investing in, after you have used your tax-free ISA allowance. What returns has the With-Profit Bond produced? Charges will apply on cashing in within one year of investing, except where you transfer the proceeds to our ISA. Metfriendly reserve the right to also apply a Market Value Reduction (MVR) so that the value when you cash in more fairly reflects our performance over the period of investment. Can I cash in part of my Bond? You can only cash in a Bond in its entirety. However, we will split large investments into individual Bonds of £5,000, and you can ask us to issue Bonds as low as £2,000 if you need that flexibility. When your Bond starts, we will send you a certificate showing your benefits and a cancellation notice. If you change your mind, you can return the notice within 30 days for a full refund.